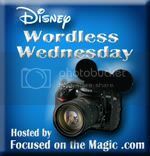 I am joining up with Focused on the Magic’s Wordless Wednesday Blog Hop again this week! This theme today is Disney Nature. When I think of “nature” at Disney World, I tend to think about Animal Kingdom first. My kids also love the random animal sightings around the Parks: when birds, ducks, and other creatures wander closeby, usually seeking a snack. It’s always fun to see how many anole lizards you can find running around too! Keep an eye out for Anoles. They’re often in the landscaping! There are also beautiful flowers and trees to be seen at Disney World–both in the manicured landscaping and all around the Disney property. What nature scenes stick out in your mind from Disney World? Thanks so much, Deb, from Focused on the Magic for hosting Wordless Wednesday each week! Check out the other posts on my site while you’re here, follow me on Pinterest, Twitter, like me on facebook, and/or subscribe to my blog. (You’ll enjoy Daily Doses of Disney on my facebook page!) Then, don’t forget to click on the Wordless Wednesday icon to check out more Disney blogs and their Disney Nature posts! Gorgeous pictures of the Kilimanjaro Safari and the little surprise critters! Incidentally – my best friend went on safari in South Africa and she says that the Disney Imagineers did a top-notch replication of the African savannah. What an incredible experience! That’s amazing to hear how realistic their safari is! It’s such an impressive attraction! Great shot of the Giraffe, they look so chilled out and delicate – yet one time I saw a couple of them racing each other in the distance on the Safari, boy those guys can really move! Love the little lizards too. Until I saw someone else with a photo of a lizard earlier, I realised I didn’t have any photo’s of them myself – funny because they seem almost as much a part of our Disney trips as the parks, hehe. I had no idea those creatures were called Anoles. Everyday when we would go back to our room at the GF I would see them scampering in front of the main door! We saw the cutest bunny at Pop Century one morning on our last visit! Great photos! Aww! Isn’t it fun to find “wildlife” when you’re out and about? I just love seeing the random duck family or beautiful birds in the trees. The giraffe looks so happy munching away. It is fun to see the creatures that come to visit the Parks. It’s so funny how used to the crowds they are. They don’t seem bothered at all by the people, so it’s fun to get close to them.